Friday Cheers at Brown's Island has three things Richmonders love: cheap shows by great bands, beautiful views of the river and lots of beer. And there's even more beer now, with three to four beer trucks at each show and more food truck options including Boka Food Truck, Curbside Creations and Strawberry Street Foods. 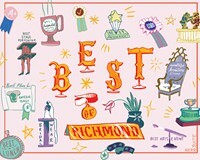 2013 may be the festival's best lineup yet, with double headliners and nationally respected acts as wide-ranging as Charles Bradley, Shovels and Rope, Lake Street Dive and Karl Denson featuring Richmond's own DJ Williams. "What I have learned most about booking this series is to trust my gut," says Stephen Lecky, festival manager for Venture Richmond. "Many of the groups we bring to the island are not well known at the time we book them, but we have faith and hope that they will be well received and fairly well known by the time we have them play." That was true when the Alabama Shakes drew a huge crowd at the peak of their media buzz. Innsbrook After Hours, operating under new manager Larry Creegar after the departure of James River Entertainment, continues to satisfy crowds. And the lovely and tranquil Groovin in the Garden series offers even more options, bringing Iron and Wine and Bruce Hornsby to this season at Lewis Ginter Botanical Garden.